At a time in our history when there should be no child that suffers comes this powerful picture book by the accomplished team of Susanne Gervay and Anna Pignataro. Based partly on the ancient parable the Blind Men and the Elephant, this outstanding work is suffused with elegance, immense spirit and a beauty that young children will recognise and draw from even if they are not able to comprehend the complexities that lie within each page. The journey of discovery begins one night as two young siblings beg their father for a bedtime tale. This particular night he tells their grandfather’s story, thus spanning the generations. From his recount, we learn of a group of children from varying cultural backgrounds intent on going out one dark night in search of a secret. They each find part of something, each certain they are right in their assumption of what it is, each unwilling to accept that their interpretation of their discovery whilst subjectively correct in one instance could also be part some bigger picture. They ‘argued until everyone was angry’ – my favourite line in the book, also one of the most disparagingly accurate of observations. It is not until grandfather appears with his candlelight that the children discover that each of them ‘was right, but also wrong’ and the magnificent elephant is revealed. Gervay’s impossibly expressive narrative articulates confusion, discord, reconciliation, and understanding, prompting young readers to ponder and question all that which they see (and hear) around them. 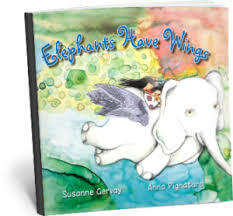 Supremely brave, eloquent and masterful, Elephants Have Wings will initiate discussion over many shared readings and is something to treasure and grow with. 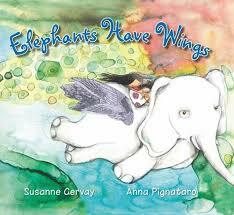 This is the second rendition of Elephants Have Wings (read our original KBR review, here). This new edition includes a fascinating foreword - The Meaning Within - which encourages young readers to seek out the rich symbolism secreted throughout every page. The Meaning Within is a useful addition offering more information about the main character, our flying white elephant, and deeper explanation of the parable behind the story themes of inclusion, acceptance, and renewal. A visual and sensual feast.